This page will take a look at the Get Back-Sessions in different way. For everybody who doesn't own the "Get Back"-Book with the new DDSI-Numbers, I want to try to make a little sense of at least some of the available recordings. This page will not run down the complete number of songs from the book "Get Back". It will examine some of the songs, that are different from the others, basing on the information in the book. The lists will be in alphabetic order. Only version that features John Lennon on (badly played) Piano. This is especially evident during the intro, where John plays some piano notes that not quite fit in with the song. This version of the song is announced by John Lennon with the words: "Nick a Tony - Take 1"
aka "No Pakistanis": completely different lyrics than the commonly known version. This version is complete. A much faster version of this song, with a completely different arrangement. 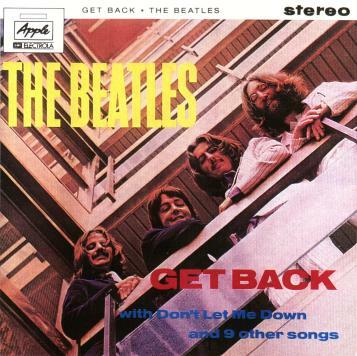 This version features Paul shouting "Hit it, hit it" during the song. This version has the special lyrics of "Don't fool around here!" during the song. 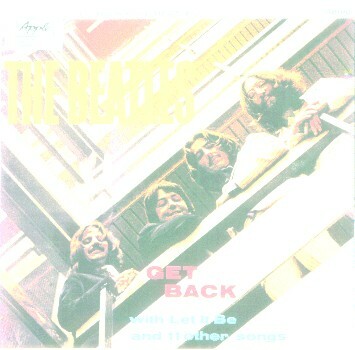 The only alternate version of "Get Back" that is also available in STEREO from the "Get Back"-Acetate . This version is sung in pseudo german and in the last verse in pseudo french. Paul is varying the lyrics once during the song, with a loud call of "Good Morning!" after one of the guitar lines. The "I had a Dream"-version, this line is shouted out by John during the song, in the same style it is known from Martin Luther King. Following the song, the Beatles have a conversation about M.L. King. This is a rehearsel take, that features a kind of "Wild West"-Intro with horse noises during the first seconds of the intro. This version has three cords played over and over again with Paul and John singing only "Beeb Beeb". This "lyric" is taken from Bo Diddley's "Road Runner"! This version is just 2:46 long. It is a breakdown, even so it was included in all three compilations of the "Get Back"-Album. This is the "goof" version, with a false start, caused by John: "I'm so ashamed... I goofed again...". This version should have the title of "I've got another Feeling", because that is what Paul sings during the intro vocals. That shows how bored the band was, having to play the same song over and over again without much improving. Missing much of the lyrics, Paul sings, whatever comes to his mind, including the line "Read the Record Mirror, Let it be...". This version is a slower approach, it feels "heavier" than other available ones. There is a STEREO-version available from the "Get Back"-Acetate . This version has a different lyric some way into the song, when Paul sings "There will be no sorrow, Let it be...". This hasn't appeared in any other version. This recording is featured in the film "Let it be" and also in Part 8 of the Video "Anthology"
This version is completely ruined by John Lennon, when he starts to sing the wrong lyrics somewhere during the song. That is especially funny, because he did a similiar thing in March 1963, when the group recorded the song for the first time. When John discovers in this version, that he's wrong with the lyrics, he can be heard saying "Oh, I did it again!". Whether he remembers doing the same in 1963 or is just refering to some other lyric mess-up that he caused during the Get Back-Sessions (and he caused a lot), cannot be proved. A complete take. This is similar to the version of "Get Back (DDSI 10.4)", it is much faster and has a completely different arrangement. This is announced on the available tape as "Take 1". There doesn't seem to be a any other numbered take. The lyrics are sung in British, Scottish and Jamaican accent. John and Paul seem to be having fun. Paul is saying "Goodbye" during the last chords of the song. I will add the entry to the page and note you as the author!